This book serves as a comprehensive source of information on post-fermentation and -distillation technology applied to wine, beer, vinegar and distillates in a broad spectrum. While most wine and spirits books focus on vineyard and crop management or fermentation and distillation processes, few address critical post process aspects of stabilization, aging, and spoilage. This book serves as a comprehensive source of information on post-fermentation and distillation technology applied to wine, beer, vinegar and distillates in a broad spectrum. Post-Fermentation and -Distillation Technology: Stabilization, Aging, and Spoilage thoroughly describes all of the operations related to these products after the fermentation or distillation steps, focusing on the complex issues related to their stabilization, aging, and spoilage. The final product must be stable against microbial activity as well as undesirable chemical and physical chemical reactions that occur in the bottle. For example, clarity, stability, compositional adjustment, style development and packaging represent the five goals of "finishing" a wine. Concerning the visual defects associated with spoilage, it is crucial that wine at the point of consumption not be cloudy or contain any haze or precipitate, especially white wines. Similarly, it is also important to prevent unwanted microbial growth from occurring in the wine after the primary fermentation is complete, affecting the flavor and aroma profile in unpredicted ways. The book addresses all of these issues and more. 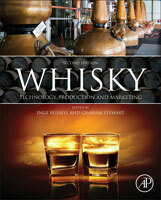 Moreover, the discussion also involves beer, vinegar and distillates, giving this book a novel and interesting approach. The book combines referenced research with practical applications and case studies of novel technologies such as square barrels, synthetic closures, and Tetra Pak®.